It is operated by pressing the door lock/ unlock switch. 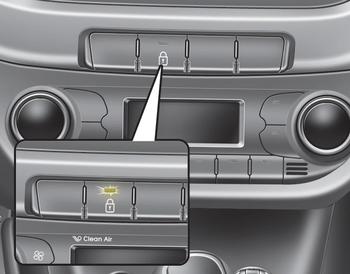 When you press the central door lock switch, all vehicle doors will lock and the indicator light on the switch will illuminate. If any door is opened when the switch is pressed, all doors will not lock. If any door is unlocked, the indicator of the central door lock switch will go off. When you press the central door unlock switch, all vehicle doors will unlock. Once the doors are locked with the transmitter or smart key, the doors cannot be unlocked with the central door lock/unlock switch. The doors should always be fully closed and locked while the vehicle is in motion to prevent accidental opening of the door. Locked doors will also discourage potential intruders when the vehicle stops or slows down.